Make 8 portraits of food entrepreneurs to combine my two photographic interests of people and food, using studio lighting. Create a series of 4 diptychs, or a pair of portraits per subject, that capture the food entrepreneur in both a studio and “natural” environment. Each setting will convey a specific mood that is consistent across all diptychs. I wanted to photograph subjects who would benefit from having professional portraits taken so I reached out to La Cocina, a nonprofit that helps aspiring food entrepreneurs incubate their business ideas, to connect with a few of its participants. My contact there connected me to Nite Yun of Nyum Bai and Nafy Flatley of Teranga Life. Through Nite, I met Reem Assil of Reem’s California. I introduced myself to each woman via e-mail, outlining my project goal and concept. I asked to meet in person so I could learn more about their stories and work. We would also begin to brainstorm together on images that they would like to have and use for their own businesses. One of the reasons I love portraiture is collaborating with my clients/subjects on their photos. I shared that I had some ideas already and showed them an inspiration board I created. I also wanted to have fun, and explore and experiment with them during our photo shoots. I love incorporating some play and discovery into my photography. The meeting was an opportunity for them to get to know me as well and feel more comfortable around me before putting a camera between us. I was unable to schedule a 4th subject for my portrait series so I decided to create triptychs for each woman I had already photographed for a total of 9 portraits. This worked really well. The final photos from this round of the project are below. The first set of three photos are thoughtful, quiet, and fierce to me. The women are not looking into the camera. The second set was the “on-site” portrait, in which they are all engaged with their food - joyful and in their element. For the third set, a result of changing from two to three portraits for each woman, I decided to present an “outtake” of sorts. Them having fun and being silly. Since these are portraits, the photos are more about the women than the food. We included elements of the food they work with but it is not the focus of the image. I also invited them to bring something traditional to wear if they wanted. When we met in West Oakland, Nite (pronounced "night") told me that "nyum bai" is a general greeting that loosely means, "Eat Rice / Let's Eat / Have you eaten yet?" She started Nyum Bai because she felt that San Francisco lacked really good Cambodian food, and to share a different story of Cambodia, a country mostly associated with a brutal period of its history, the Khmer Rouge. Nite wants to share the lesser known story of Cambodia in the 60's, in which her parents grew up. Nyum Bai is her way of allowing others to experience Cambodia in a different way: delicious comfort food served in an environment that is inspired by vintage decor and music from that Golden Era in Cambodia. Nite used to work as a graphic designer and mentioned that she wants a "whole brand of comfort food set in a fun way." For her on-site photo shoot, we decided to photograph in her home kitchen, which has a beautiful vintage stove that would be an appropriate prop in some shots. She wore a fun, vintage dress with a print of tropical fruits that she had bought on a recent trip to Cambodia. She applied make up and did her hair in the spirit of the 60's. It was fun to style her kitchen. We took advantage of old black and white prints of her family, and decorative objects and cooking implements of cultural and historical interest in the background. For her in-studio photo shoot, we decided to use lemon grass for her food element. The outtake photo is with her holding both lemon grass and daffodils. She came into the studio and lamented that Whole Foods didn't have a great selection of lemon grass so she bought the daffodils in case we could use them as look-alikes. We tried both in a few photos and quickly realized that they didn't work. But we had a good laugh over her creative problem solving. Below are some photos she liked from her studio session. Here's a great article on Nite in Saveur. She has pop-ups in SF and East Bay including at the Thursday Mission Community Market. I can attest that the food is delicious. I had to do my "research," of course! Follow her on Facebook and Instagram for her pop-up updates. 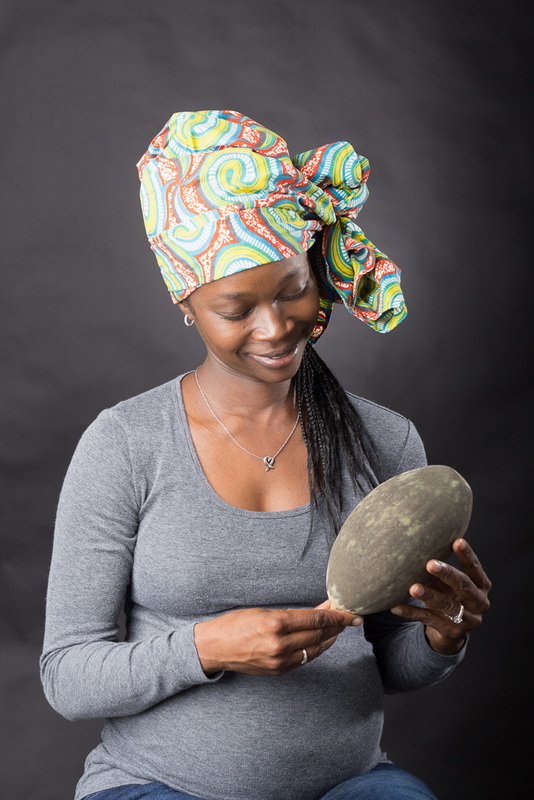 One of the first things Nafy told me when we met was that her earliest memories were of her grandmother making baobab fruit juice for her as a child in Senegal. Nafy started Teranga Life because she wants to pass on this refreshing and healthy traditional drink from her homeland to others. As Nafy explained to me, "teranga" means "comraderie / hospitality / open-mindedness / generosity" in her native Senagalese. And home made baobab juice is often the first thing that is offered to guests. Nafy used to work in marketing but has dedicated the past few years to developing her products and business through Teranga Life. 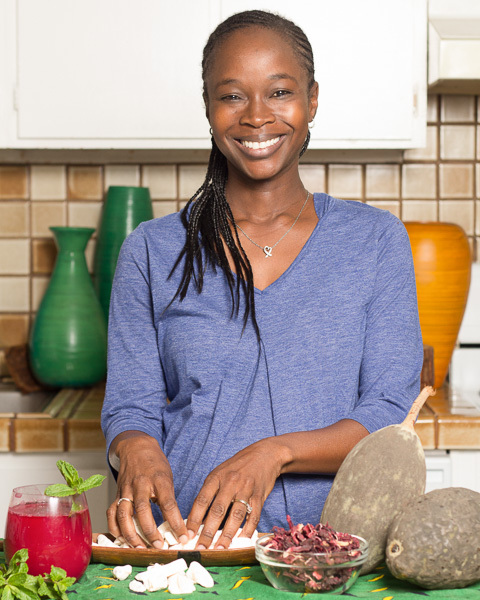 For her on-site photo we photographed in her home kitchen, which is where she tests out new flavors or recipes for her line of baobab juice products. We displayed the various ingredients she uses for her different juices on top of a traditional textile. Working with the space I had, I strategically moved some beautiful and colorful wooden vases behind her on the kitchen counter to provide a more photogenic background. I also took close ups of her juice ingredients. Clockwise from back left: fresh mint, baobab fruit (white pieces), tamarind, dried white hibisicus (in her hand), nutmeg, and dried red hibisicus. 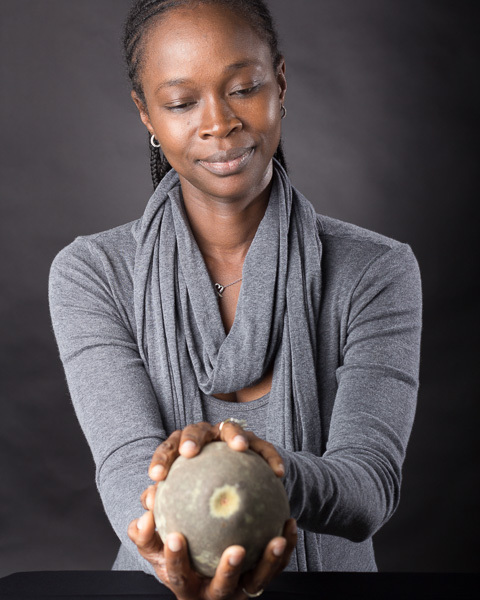 For her in-studio photo shoot, we decided to use the baobab fruit as her food element. It is a beautiful fruit. She also brought a number of traditional scarves to wear. Nafy is a natural in front of the camera. We both had a ton of favorites from her proof gallery. Here are a few. You can also see that she was quite pregnant when I photographed her! I was so grateful she agreed to work with me since she was expecting her third child within a couple months. You can also follow her on Facebook and Instagram to get updates! Reem is all about cultivating and conveying Arab hospitality through her food and business. When I met her and asked more about Arab hospitality, she said it means to "feel at home, to feel the warmth." 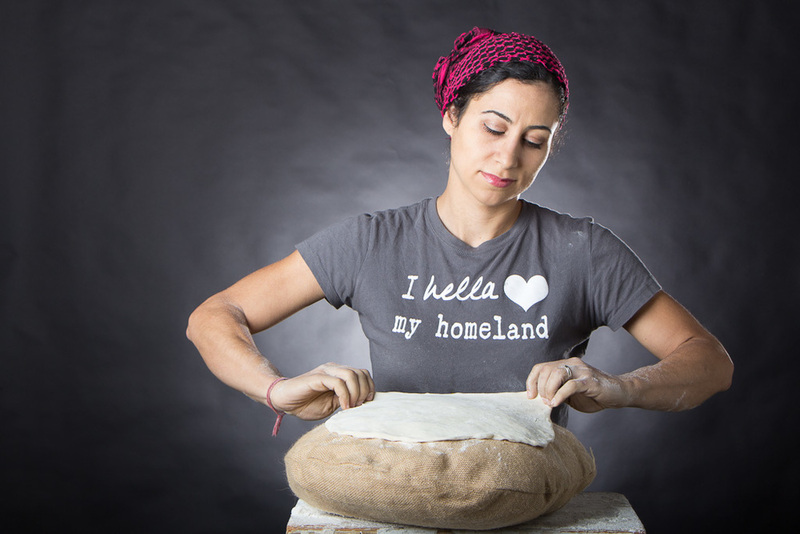 After years organizing the community around social justice causes, Reem decided to professionally pursue her love of baking by enrolling in courses at Laney College. Now she creates community through her crave-licious man'oushe, Lebanese flatbread, topped with fresh, seasonal deliciousness. For her on-site photo shoot, Reem shared that the SF Chronicle photographed her at home in the kitchen, and wanted to do something different. (In preparing for my shoot with Reem, I checked out that article as well as this mouth-watering cook book.) With me she wanted to recreate the feel of an Arab street market at dusk. She shared that it is common for locals to gather and buy their man'oushe hot from a vendor working the saj, a traditional griddle, at these street markets. Reem has a stall at the Mission Community Market on Thursday evenings, so we planned for and photographed her working there. 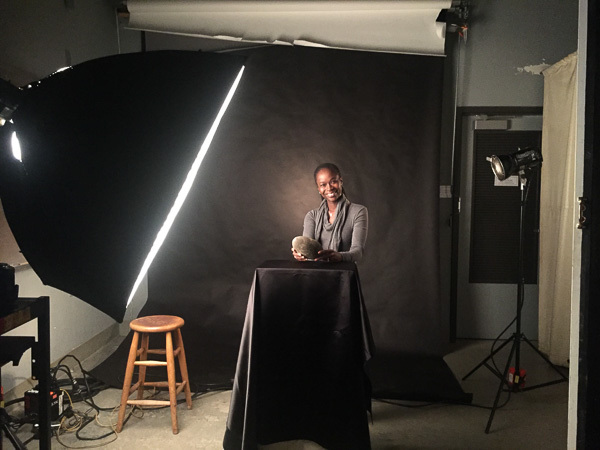 For her in-studio photo shoot, we agreed that it would be fun to feature the pillow she uses to stretch the dough into man'oushe, and to play with dough and flour as her food elements. She also brought a number of beautiful kufiya, traditional Palestinian scarves, that she wore in different ways. Reem's man'oushe is so good - I've found myself craving them. Plus she has vegan options! If you want to try her addictive flatbreads, check her out at the Mission Community Market on Thursdays from 4 to 8 pm. You can also follow her on Facebook and Instagram to get updates on other places she serves up man'oushe in SF and Oakland. People skills are so essential for great portraiture. Even with the initial meetings with my lovely subjects, being in front of a camera was still awkward. I’m not at the point yet where I have the technical down like the back of my hand so my brain is still working hard to multitask the technical stuff with the personal interactions. I love creative collaborations. They’re great opportunities for pushing myself to do more, learn, and be flexible. I don’t think I would have done the photo of Reem outdoors had she not wanted that setting. I’m glad she suggested it though. It was a great challenge to use artificial lighting as the primary light source on a very sunny day outdoors. Plus the logistics of photographing with gear and lots of people around for the Mission Community Market. Special thanks to Keith Bodziak who assisted me on that shoot. And with the right people, collaborations are inspiring and fun. It was incredibly rewarding to work with Nite, Reem, and Nafy. They shared their stories with me and I heard a common thread of: shifting gears from one career to pursue a passion as a livelihood; sharing cultural values and nurturing community through their traditional and healthy food; and creating a business and meaningful work that reflects the world they want to live in. I heard myself in them and feel honored to have been able to support sister women entrepreneurs. Nite likes her portrait prints! I can’t wait to see where they go with their business dreams and to work with other inspiring people along my photography adventure. P.S. As I've been crafting this blog, I've been referencing their websites for additional information and it's been a total kick to see that Nafy and Reem are using some of my photos in their marketing materials!